Horo - Really nice experimental terrain and great choice of texture. OMG! I had no idea that the Bracket in the TE actually did that! When I read the Bryce 4 Bible in regards to Masking, I didn't understand some parts of that section; I knew the different colors were supposed to give different masking styles, but each time I used it and apply an effect, the whole terrain would be affected and I would get frustrated. Thanks a million for clearing up Bryce's Masking Mystery. Slepalex - Awesome experimental terrain! Rasberri - Very cool Qubicle Voxel terrain. Did it take long to import it? This Metamorphosed landscape was created by duplicating the affected terrain, Dampening it and Posterizing it. This was done prior to discovering Bryce's Masking Mystery. Eugenius - you are welcome. With this, I'm only a day ahead of you. I discovered it only yesterday. I also like Slepalex's method very much. It appears that the Unpaint option works for many things. Your terrain is just awesome. I started playing with the TE to see all kinds of different results. Decided to put them in a number of pictures. Where I indicate 'higher' or 'increased' or 'positive' I mean that the move of the effectbutton was to the right, lower, negative to the left (no, not logical, I know). I started from one of my WM landscapes. I hope the name of the filters is understandable, once you see the options. I used only the original filter settings, without change. Here is an example of using the TE with a lot of ALT-posterize + some equalizer and subplateaus. These are multiple, slightly different terrains, with a rather flattened and extended terrain in the back. Hans, it would be more obvious if all this is done on the terrain by default. And I did not notice the difference between Ctrl + and just Posterize, Equalize, etc. This is the result of Posterize, Subcontours (pull the mouse to the left!) and little to blur (Smoothing). It will be like rice fields made on the slopes of a mountain. Something like rice fields. But there is still a lot of work. It is necessary to bring this reception to the simplicity and perfection. Horo: Thank you for the tip with the brackets and terrain masking. Wow the mysteries of Bryce! Hansmar - thank you for your work to show examples of all options. I haven't noticed any difference when using the Ctrl key for posterize and reliefnoise in my tests. Slepalex - very nice examples. There are so many possibilities with the TE. Rasperri - also very nice examples. Hansmar - Nice work on the examples. Slepalex - Good job on the terrace terrains. Rasberri - That's awesome that it didn't take time for the Qubicle mesh to upload; usually, most terrains do. Nice work by the way. For my Bryce Masking/Clipping experiment, I decided to create an unusual terrain in GeoControl Demo of a canyon with a few terraces and mountain-like slopes. 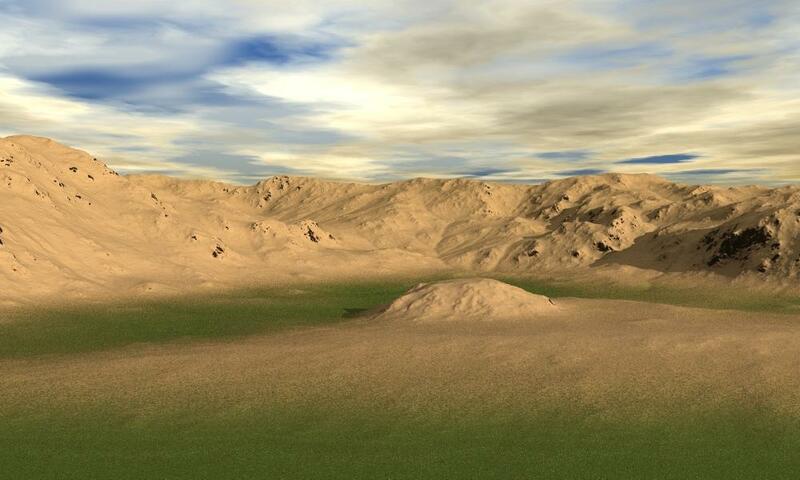 The first image shows the original terrain imported in Bryce. The second image shows the same terrain, triple-stacked and clipped in a way to make the terraces more prominent. Eugenius Maximus.. I love this terrain! - I am going to do some experimenting when I get home in WC1. I do a lot of playing around in a small program that comes with the Video Game: "The Sims 3" - You may be heard of it. It iis referred to as "CAW" or Create a World. You can download it for free (but I think you may need at least the base game) Anyways - this would be a perfect terrain for a Sims 3 neighborhood. I don't know who created the software for EA Games - but they really should team up with the Bryce Developers. I have created some pretty awesome terrains in this program (you can export your terrain as a png height map) - but the editor gives you the ability to hand sculpt and paint the terrain in real time by hand.. something I wish you could do in Bryce. I think VUE's TE has some similar qualities--at least with the real time sculpting. I have used some of my terrains from CAW and imported into Bryce - - I can share some of these- they are a bit cartoonish, but have had great fun in this program. Rasberri - Thanks, I love experimenting. Yes, I've heard of The SIMS 3 game and just checked out Create A World; one does need the game in order to download it. The reason behind of why that I had started this thread originally was because of the Halo games, specifically Halo Reach. The landscapes throughout the game are amazing and so I got frustrated when it came to producing similar terrains. I also do wish Bryce had a terrain painting lab and that the Lattice was more like Modo or Sculptris. Please do post the CAW terrains when you get a chance; I'd like to see them. 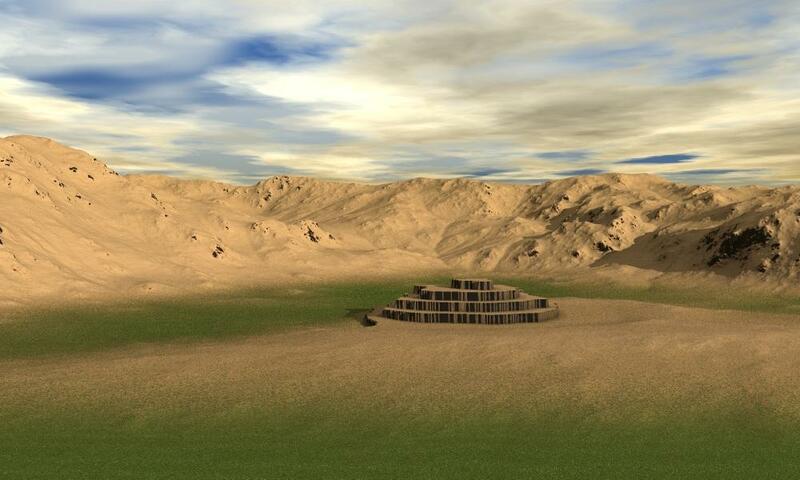 Below are terrains from one of the worlds I created in CAW.."The Forgotten World". I originally generated this terrain in WC1 and sculpted it further in CAW. I then exported the png terrain into Bryce (obviously the texturing is off here). I included 2 closeups of the CAW world, you can paint textures right onto the terrain.. I painted a coral reef texture onto the terrain in the water.. would like to replicate that in Bryce. The purple boxes that appear are effects you can apply.. such as waterfalls, waves/surf, etc. in CAW (WC2 includes some similar effects). I couldn't find a way to turn off the purple boxes temporarily. Alex, I agree. However, I started out looking for a nice terrain by starting with a WM one and then using the TE. After a while I decided to just make pictures of variants. So I did not decide to go back from scratch. And indeed, CTRL tends not to really do something. However, I tested it and the pictures where CTRL are indicated were made with CTRL, even if that did not have any effect. I saw one effect, but forgot to write down, where using CTRL appeared to give smaller steps than without CTRL. But it may have been my imagination. I also tried Shift (no effect) and Alt (no effect, except at posterize). Rasberri, Mermaid, Horo, Eugenius: thanks. 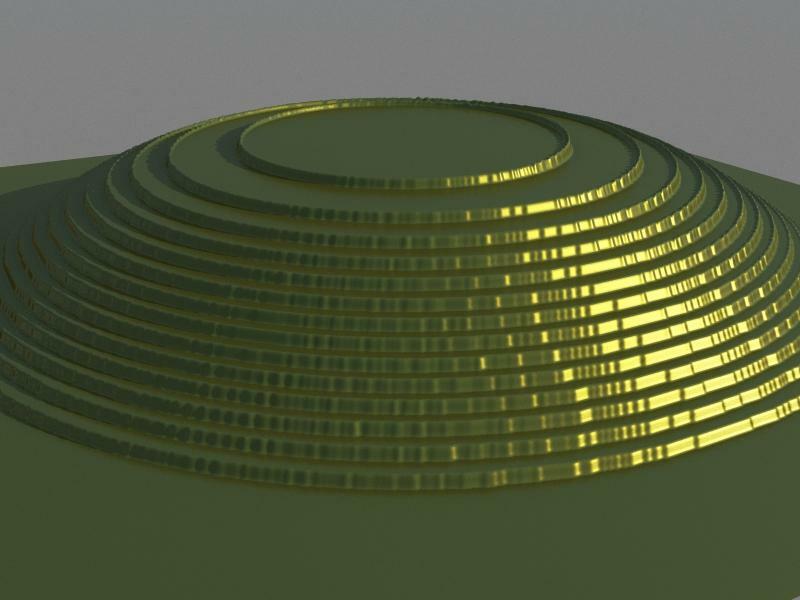 Alex: the first 'rice-field' beginning could be a (round) pyramid structure. I like your experiments. Eugenius, Rasberri: Like your experiments too! Rasberri - The CAW images are awesome and the fact that you can import the terrains from World Creator, makes it tempting in trying to create some landscapes for Sims 3. The folks at EA have come a long way with the Sims games. In my last remarks, I was referring to Bryce's Symmetrical Lattice, in the hopes that DAZ would make it more like Modo or Sculptris. Though now that I'm experimenting with Bryce's TE's brackets (thanks to Horo), I wonder how the results will be by applying them to the Symmetrical Lattice. A new thread may have to be started just for that can of worms. Love the 'ForgottenLand4' work, Rasberri....wish you could develop it more (you know it looks unfinished). Rasberri - The other night, I tried adding a material to the terrain, but no matter which texture I used, the whole thing looked kinda "blah". So I decided to duplicate 2 of the 3 terrains and clip them so that the terraces are separated from the slopes (5 terrains in all). I then had to find materials that complemented the terraces, and another for the slopes and started color matching them in order for them to blend. I still have some work to do, but unfortunately, it's my bedtime. Hansmar - Thanks; still experimenting. P.S. I'm with Jay; ForgottenLand4 is really cool. Love the boat in the background. I included 2 closeups of the CAW world, you can paint textures right onto the terrain.. I painted a coral reef texture onto the terrain in the water.. would like to replicate that in Bryce. You cannot draw directly on Terrain in TE, but you can import your bitmap texture into Bryce and apply it in the texture editor to your terrain as World Space or World Top. You can also create your own unique texture in DTE or take it in the library. Some experiment with Posterize and clipping the top and bottom brackets, both alternately and simultaneously, also worked with the UnPaint brush. But first I created a height map from my own set of brushes, then added Warped Ridges. So, reading this thread gets me to thinking that you encourage not to try "bryce purism" but instead generating/drawing terrain maps in external software or means and then import to Bryce "as it is" OR "with further modifications in terrain editor", right? So in the end, Bryce is more like "studio for making composition" in a way. Just the opposite! If you count messages, then most of it will be dedicated only to TE and only then to external editors. 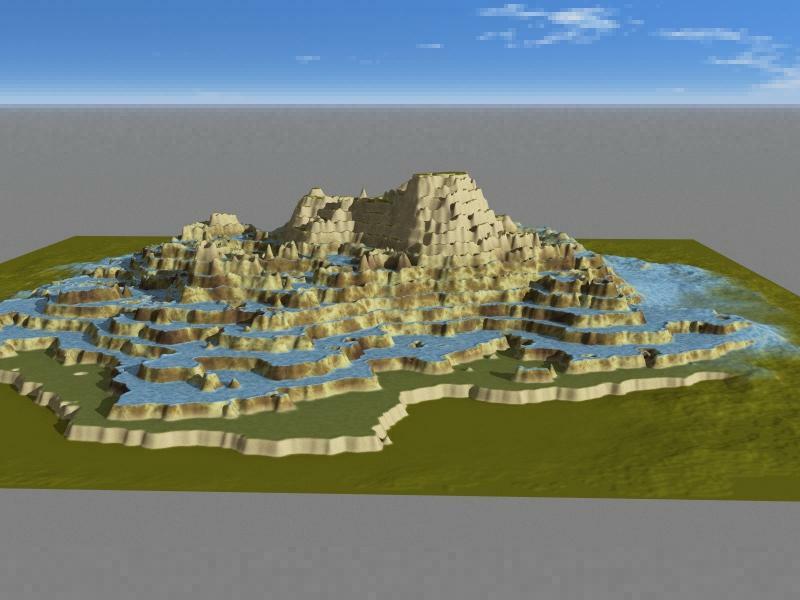 And at first this topic began with the words "World Machine", but I asked the author of the topic to change it to the current one, which begins with the words "Terrain Editor". Ps. Once again - on the contrary! I downloaded only one example of import from GeoControl2, but I did it as follows. 1. I create a mountain range (I draw with brushes by default and / or use my own, previously created) in TE with erosion and other manipulations. 2. I assign the material, I rate it from the view of the camera after the render. 3. I export the terrain to GeoControl2, apply noise by default, make terraces and other changes, change the resolution if necessary. 4. Import to Bryce and watch the result. Usually after importing a height map of 16 bits of gray, you need to reduce the terrain height by 2 times (or more). It’s just that some users haven’t quite mastered the work in TE and do not understand its internal mechanism. This is noticeable in the publications. There is also something that i meant when i was questioning in that tutorial list thread - i was under impression that 80% of (video) tutorials that i see focus on either lighting/skylab or DTE/materials, and not on terrain making. Just creating a landscape usually does not cause difficulties. The height map can be drawn in any 2D editor. The gray level of 100% (white) is the highest point, the gray level 0% (black) is the lowest point of the landscape. Here we discuss only the little-studied and still hidden possibilities of the TE. But you can feel free to ask any questions on this topic. It is for this purpose created. As a lesson for novice users, this is one of the variants of my work. I have two height maps. The first one was created with brushes and erosion in TE, the second one in TerraBrush. I load these elevation maps into a custom brush library in TE. In TE, I mark "New", take a round brush from the library and with a small size (dark gray level) I click in the foreground. Then I load a brush with ridges and with a maximum size and gray level of 100% (white) I click in the center of the height map and get something like the following result. I export the elevation map to GeoControl2 (after copying the Alt + C matrix), increase the resolution to 2048, use a couple of filters, save it as PGM, load it into Bryce and insert the Alt + V matrix. As a result, the new terrain acquires the same proportions and position in space. Then I apply posterization, after which I use the UnPaint soft brush to erase the posterization results on the whole terrain, except for this elevation in the foreground. And thanks for sharing knowledge, been bookmarking many pages of threads with such posts.